What is a 'Link' and how do I find it? The comments on my personal page have all disappeared! How do I get them back? Nice site - what else have you done? I've seen this picture before! Where's my picture? How do I play sudoku? How do I use the online player? How do I print out puzzles? How do I save and load games? I found 2 solutions to a puzzle! How do I check this? How do I become a supporting member? I don't use Paypal, do you accept cheques? I don't have Paypal or a Cheque account, how do I become a supporting member? Hey, you billed me without my permission! What's going on? How do I check when my membership expires? The link (also called 'url' or 'web address') is found at the top left of your browser. Links are extremely helpful when trying to show a part of a website to someone else, as you know that you are both looking at the same page. This is a known bug, and occurs when the database cannot be read when you are trying to view your comments. To get your comments back, just post another comment on your page. There is currently a large wait before pictures submitted to 'Easy' are displayed (over 2 years), so to get them seen earlier, they are shown on other websites. These include JigsawOnline.net, Kakuro.cc, FreeCrosswordPuzzles.com.au and others. Every picture that is shown on these smaller sites will eventually be shown on sudoku.com.au as well - the pictures are not duplicates, this is by design. 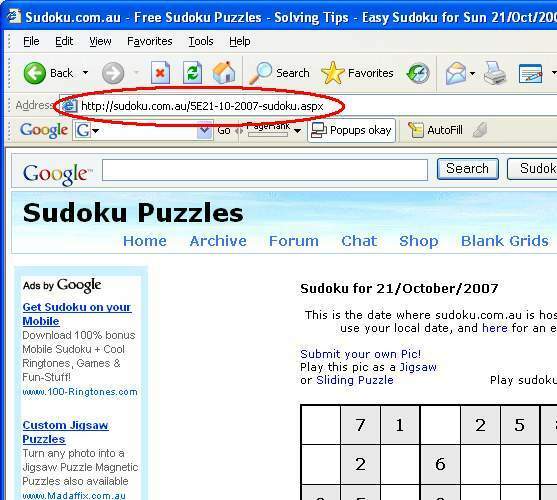 Every 2 weeks, all user submitted photos are downloaded from sudoku.com.au in a batch (typically 50-100 photos). Duplicate photos are removed from this batch. These photos were not checked against already accepted photos (2000+) as it was judged too hard/time consuming. Any offensive/incomplete photos are removed. Photos are reloaded up to to sudoku.com.au, ready to be shown when a sudoku is solved. So, you can see that if a person submits the same photo months apart it will be accepted every time - and duplicates occur. A few months ago (July 2007) there was a lot of duplicates displayed and the process was changed. Now, new photos are compared to already accepted old photos to make sure they have not already been accepted - so duplicates cannot occur. However, for duplicates that are already in the system (added pre July 2007) it is now too difficult to remove them, and we just have to wait till they have all been passed. If you are waiting for your picture to be shown, rest assured, it will eventually turn up. Try here for a full list of acceptance criteria. The print options are found on the top right of the page, just under the difficulty options. To save a game, just press the 'Save' button. The saved game is stored as a cookie on your computer - if you delete the cookies in your browser, then your saved games will be deleted. To Load a game, first go to the same day/difficulty as the puzzle that you saved. Eg: If you pressed 'Save' for the Hard puzzle of 1/May/2007, when you come back (maybe days later), go to the Hard puzzle of 1/May/2007 again. Then press the 'Load' button, and your saved game will automatically load. You can choose different dates in the Archive section. When solving puzzles from other sites or newspapers, occasionally the puzzles allow more than 1 solution. You can check to see if a sudoku puzzle is valid here. If the puzzle is invalid, then I'm sorry, but we can't really help. If you think that a puzzle on this site has more than 1 solution, then definitely send in the puzzle with the 2 solutions. Be sure to check it carefully though, as plenty of people have sent in alternate solutions and not one has been correct. We'd love to have you as a supporting member. You can find the full details - Becoming a supporting member. Paying via paypal is the easiest method, and allows you get your sudoku membership within minutes. If you do not have a PayPal account, you will be walked through setting one up when you apply for membership. You can cancel your membership and paypal account at any time. Full Details. Cheques are definitely accepted, though they must be in Australian dollars (the bank charges for foreign cheques are more than the sudoku membership is worth). Full Details. Hmmm, this is a bit tricky. For the moment, I would recommend continuing to enjoy sudoku.com.au for free. The sudoku supporting membership is a recurring subscription, and you will be automatically billed every 6 months. This is a recurring subscription, and you will be billed automatically every 6 months, so you don't have to worry about forgetting to pay & losing your ID. You can cancel your subscription at any time via paypal.com. Also, if you forget to cancel, and are billed, then we can give you a refund (contact us within 10 days of being billed). Click the 'Update Details link at the top right. Scroll to the bottom of the page and press the 'Cancel Subscription' button. If you forgot to cancel your membership and get billed accidentally then just Send an Email and a refund will be given, no problem. The expiry date of your membership is listed just under your Email Address.